Mission Chinese chef-owner Danny Bowien at the Mind of a Chef premiere party. Image via Getty. 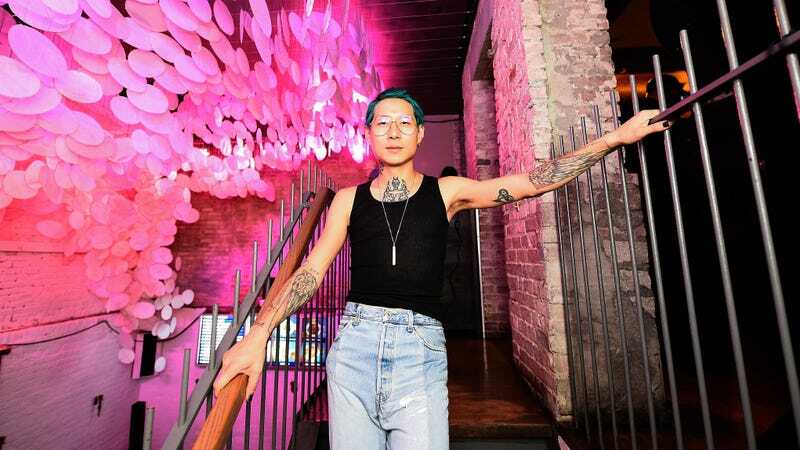 The suit, which was first reported by Eater, details distressing behavior made even more so by the fact that Misson Chinese’s public presentation is that of a progressive and safe space for queer people and people of color. Erin Lang, a former server at the restaurant, told Eater that the reason she took a job at Misson Chinese is because she was “tired of working in hostile environments, with favoritism and verbal abuse.” Horrifyingly, the suit alleges that black staff at the restaurant faced racial discrimination and physical harassment, like “a kitchen staffer burning the arm of a black employee with a spoon dipped into hot oil” and that management repeatedly ignored complaints about the behavior in question. Bowien is named in the suit, along with Jane Hem and Adrianna Varedi, both of whom were managers. Lang was treated especially poorly by Jane Hem, one of the women named in the suit. Lang, a queer black woman, alleges that she was denied promotions and saw her shifts reduced because of racial discrimination, especially after Hem became an assistant general manager in October 2016. The suit claims that Hem often directed racially charged comments at Lang — saying that she wouldn’t want to be with Lang “in a dark alley,” mocking Lang by using “hip hop” slang, and suggesting that Lang’s dreadlocks looked like “Grinch’s fingers.” Hem also complained that Lang was too “aggressive” and didn’t smile enough, the suit alleges. Other racially discriminatory behavior alleged by the former employees includes kitchen staffers calling Latinx employees “wetbacks” and saying that they couldn’t wait until all Latinx people were deported after Donald Trump’s election. The four staffers named in the suit complained to human resources after witnessing these incidents; shortly after the complaints were lodged, the emlployees in question were allegedly subjected to a more hostile work environment, perhaps as retaliation. Restaurants are notoriously difficult places to work and the lack of protections for their employees make it so that any and all misbehavior flies under the radar, festering. Bowien’s Mission Chinese feels especially egregious. Since the restuarant’s inception in San Francisco, as a pop-up sharing space with an existing Chinese restaurant deep in the pre-tech bro Mission District, Bowien has championed himself as a wunderkind, teaching himself how to cook Chinese food and then bastardizing Sichuan flavors with American sensibilities: “stonery” food like the fried rice burrito and the kung pao pastrami are just two of his hallmark dishes that somehow, actually work. Bowien also hired Angela Dimayuga, a queer woman of color, to open and then run his first New York outpost of the restaurant. Dimayuga quit after realizing that there was probably no room for her in Bowien’s overall vision; he opened a Bushwick outpost of Mission Chinese and she quit, after working as head chef for six years, and, in her words, shaping what we know as Mission Chinese food while Bowien filmed a season of PBS’s popular series, The Mind of a Chef and continued to see his star rise. Read the full report at Eater here.